The Movement for the Actualisation of Sovereign State of Biafra, MASSOB, has issued a stern warning to the controversial Catholic priest, Reverend Father Ejike Mbaka, to stay away from the Nigerian politics. The group further advised the Catholic priest to face his spiritual calling and wash his hands off the dirty politics played in the country, stressing that Nigeria’s politics was beyond his comprehension. The call came after President Muhammadu Buhari and other Northern leaders congratulated the outspoken priest on his 21 years of priesthood. A video resurrected by Premium Times on Sunday, August 21, 2016, showed Father Mbaka launched another verbal attack on former President Goodluck Jonathan and past leaders of the country. The undated video shows the cleric accusing Jonathan’s “men” of plotting to kill President Buhari among other incentives. 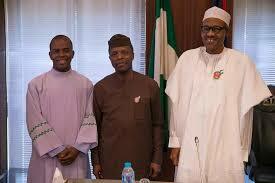 “Goodluck Jonathan don’t (sic) deserve to be in Nigeria,” Mbaka said. “God forbid that we will be among the party that will be clapping for you while you are going wrong. He should stay clear of the Nigerian politics before it drags his spirituality to the dust,” the statement said. MASSOB accused President Muhammadu Buhari and the Northern elders of celebrating Mbaka’s 21 years priesthood because the priest was dancing to their music. “People now see him as a Priest who is always going to Aso Villa for selfish interest. He can never serve two masters at a time, if he wants to be a politician, he should forget about priesthood,” the statement added.